RAF MARCHESINI is one of the most known and appreciated Italian DJs and Producers thanks to its original and unmistakable style. After a long experience Started in the '90s as a resident in his city Verona, for years ago to unleash the public with his eclectic DJ set in the best clubs in Italy and Europe, sharing the line-up with big names like Axwell, Sebastian Ingrosso, Erick Morillo. In 1997 RAF MARCHESINI also began working as a producer, arranger and composer and became part of the Media Records team with which he made many projects including Brahama "Future Love" with Paolo Sandrini and Mauro Picotto. In the years between 1999 and 2004 he collaborated with several recording studios producing productions and remixes for labels such as Time, Do It Yourself, Saifam, New Music, Hitland, as well as singles of important artists such as Tony Di Bart, Carolina Marquez, Hard In Tango, Popstitute, Mario Più. In 2004 he began an interesting collaboration with the Saifam team with whom he achieved great successes in the following years: Lanfranchi & Marchesini "Boys And Girls", Desaparecidos "Ibiza" and "Fiesta Loca", Ocean's Four feat. Adam Clay "Beautiful Life", Frankie Gada vs. Raf Marchesini "Rockstar", just to name a few. In 2009 he inaugurated his recording studio, in which he produced successful productions such as Raf Marchesini & Max B "Faraò" and Fedo, Camurri & Marchesini "Babylon", who arrived at the top of the Italian dance charts and in many European countries. 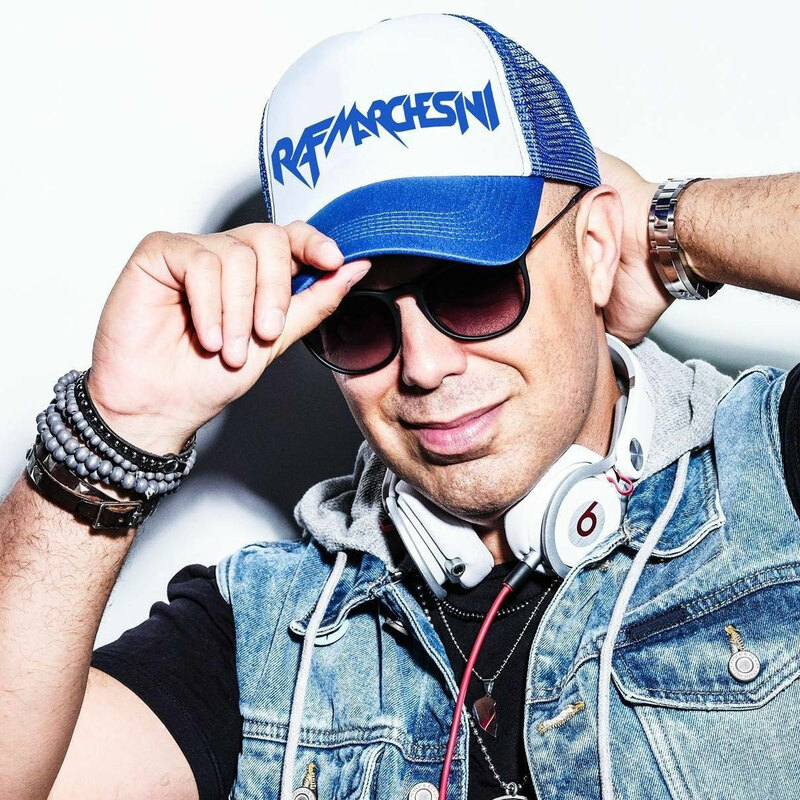 RAF MARCHESINI is also widely known as a remixer and many of his works have become international hits, such as remixes made for: Desaparecidos, RIO, DJ Antoine, Alexandra Stan, Datura, Lucenzo feat Big Ali, Alex Gaudino, Cristian Marchi, Rudeejay , Andrea Paci feat. Michelle Weeks, Gubellini & Pain, Nicola Fasano, Loco Tribal, 2 Someone and many others. His works are published all over the world on prestigious labels such as Spinnin ', Ultra, Ministry of Sound, Universal, Hed Kandi, Avex, Pacha and supported by top DJs such as David Guetta, Bob Sinclar, Gregor Salto. In 2009 he received the 2009 Nightstar Award "Best Italian Producer" at the Papeete Beach in Milano Marittima. Since 2019 he has been the official DJ of SUBURBIA, the historic brand of house music made in Italy, which today is an innovative format ready to entertain and excite clubs all over Italy with an extremely engaging show. RAF MARCHESINI begins 2019 with the new single "YOUR BODY", created together with the emerging B2B and the important vocal featuring Adam Clay, a project that is already climbing Italian dance charts. RAF MARCHESINI è tra i DJ e Producer italiani più conosciuti ed apprezzati grazie al suo stile originale ed inconfondibile. Dopo una lunga esperienza Iniziata negli anni '90 come resident nella sua città Verona, da anni fa scatenare il pubblico con il suo eclettico DJ set nei migliori locali d'Italia e d'Europa, condividendo la programmazione artistica con nomi del calibro di Axwell, Sebastian Ingrosso, Erick Morillo. Nel 1997 RAF MARCHESINI inizia anche l’attività di producer, arrangiatore ed autore musicale ed entra a far parte del team Media Records con il quale realizza molti progetti tra i quali Brahama “Future Love” con Paolo Sandrini e Mauro Picotto. Negli anni tra il 1999 e il 2004 collabora con diversi studi di registrazione realizzando produzioni e remix per etichette quali Time, Do It Yourself, Saifam, New Music, Hitland, nonchè i singoli di importanti artisti quali Tony Di Bart, Carolina Marquez, Hard In Tango, Popstitute, Mario Più. Nel 2004 inizia l’interessante collaborazione con il team Saifam con il quale realizza grandi successi negli anni successivi: Lanfranchi & Marchesini "Boys And Girls ", Desaparecidos "Ibiza" e "Fiesta Loca", Ocean's Four feat. Adam Clay "Beautiful Life", Frankie Gada vs Raf Marchesini "Rockstar ", solo per citarne alcuni. Nel 2009 inaugura il suo studio di registrazione, nel quale realizza produzioni di successo quali Raf Marchesini & Max B "Faraò" e Fedo, Camurri & Marchesini "Babylon" arrivate ai primi posti delle classifiche dance italiane e di molti paesi europei. RAF MARCHESINI è molto conosciuto anche come remixer e molti dei suoi lavori sono diventati hit internazionali, come i remix realizzati per: Desaparecidos, R.I.O., DJ Antoine, Alexandra Stan, Datura, Pooh, Lucenzo feat Big Ali, Alex Gaudino, Cristian Marchi, Rudeejay, Andrea Paci feat. Michelle Weeks, Gubellini & Pain, Nicola Fasano, Loco Tribal, 2 Someone e molti altri. I suoi lavori sono pubblicati in tutto il mondo su etichette prestigiose come Spinnin’, Ultra, Ministry of Sound, Universal, Hed Kandi, Avex, Pacha e supportati da top DJ quali David Guetta, Bob Sinclar, Gregor Salto. Nel 2009 ha ricevuto al Papeete Beach di Milano Marittima il Premio Nightstar 2009 "Best Italian Producer". Dal 2019 è il DJ ufficiale di SUBURBIA, brand storico dell'house music made in Italy, che oggi è un format innovativo pronto a far divertire ed emozionare i club di tutta l'Italia con uno spettacolo estremamente coinvolgente. RAF MARCHESINI inizia il 2019 con il nuovo singolo "YOUR BODY", realizzato insieme agli emergenti B2B e con l'importante featuring vocale di Adam Clay, progetto che sta già scalando le classifiche dance italiane. ©Raf Marchesini™ Official Website. All rights reserved.